Heavy-duty timber bollards used in a park setting. The market for mass park bollards will always be subject to high levels of competition from low-grade timber substitutions and to price sensitivity. 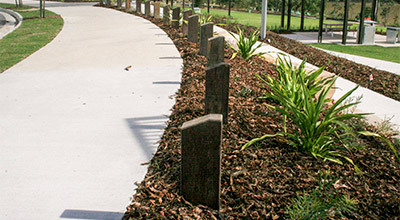 While Outdoor Structures Australia has generic products in this category, we also produce park bollards that are unique in the market and are specific to OSA. This reflects our approach to our client’s market focused on quality design that is above the lowest common dominator pricing. Expanses of rail-less boundary fencing (typically this is a non-intrusive bollard). There are two (2) main forms of bollards for park environments: ‘Mass’ and ‘Feature’. Fabrication from FCDD has the advantage of removing the bollard from the mass market and offering additional benefits of lifespan, lower maintenance and limiting the ability of competitors /installers to substitute with cheaper products. Moreover, there is the ability to use negative cut pieces in production of a composite timber and FCDD bollard, to further enhance the bollard range in a price competitive manner. Given the long runs of bollards that traverse the park landscape there is the opportunity to design for ‘mass effect’ as an experience rather that the individual item as a sculpture. These are located at points of entry, street intersections or activity centres. Demarcations for entry points or a change in conditions. Presently, park bollards are in many ways conceptually closer to fencing - purely functional barriers that offer little to the space or the activities that occur there. However, given park environments are primarily recreational and dominated by children; the rationale exists for feature bollards to be fun or engage the passerby/user (who is open to the perception of messages given the environment). Noting the simplicity of the park landscape, design trends generally focus on primarily simple forms. Detail is applied with banding or capping that forms the proprietary controllable item. Please contact OSA with any questions on our park bollard range.